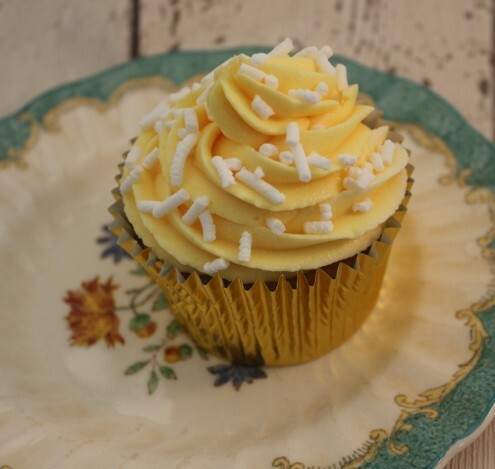 Aside from being a deliciously zesty Lemon Drizzle Cupcake, this one is probably the lightest and fluffiest out there. You can fill your muffin cases with confidence as these rise up only a little further than you fill them and come out of the oven perfectly level, which makes them easy to decorate. Though I am no scientist, I have noticed that the ingredients start to react as soon as they are mixed so make sure that you get these straight into the oven! In a large bowl, combine your oil, soy milk, soy yoghurt, sugar, lemon juice, lemon zest, and vanilla extract with a quick whisk. You can do this by hand, mixing just enough so that all of the ingredients become one pale yellow liquid. Set this aside. Weigh your flour, raising agents, and salt into a second bowl and combine. Add your dry ingredients to your wet ingredients. I strongly recommend that you go slowly, adding in maybe 3-4 portions. You will find that the first amount of dry ingredients added results in lots of lumps but don’t panic! Bop any suspiciously large looking lumps of flour with your wooden spoon and stir calmly until only a few lumps remain, before adding more of your dry ingredients. Once all of the flour has been added, you should be left with a smooth pale cupcake batter. You may find it easier to transfer this liquid to a jug and pour into your cupcake cases. Bake for 20-25 minutes at 180°C in a preheated oven, until risen and golden. The rise on these cupcakes is fairly even so you are looking for a flat rise, rather than a peaked dome. You will know that they are done when they are springy to the touch. Prepare a simple lemon syrup by heating 100g caster sugar in the juice of 2 lemons over a low heat until all of the sugar has dissolved. While the cupcakes are still hot, drizzle a teaspoon of your lemon syrup over the top of each one. Be careful not to let the syrup run over the edge of your cupcake case as it will make them incredibly sticky! Top your cupcakes with a generous swirl of Vegan Vanilla Buttercream and a little more lemon zest or a handful of toasted almond flakes.